If you’re looking for an iconic hotel in a prime South Beach location with fun and facilities for every age, then look no further. Fusing old school glamour with modern conveniences, this is a striking property that exudes luxury and style. The hotel offers genuine attention to detail, ensuring that your stay is filled with endless possibilities and fantastic experiences. 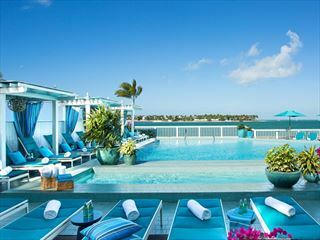 The Fontainebleau Miami Beach is a spectacular hotel, with a variety of restaurants and bars ranging from the classic American steakhouse Stripsteak, to family favourites at the American Brasserie “Vida”. There is a world-class spa and fitness centre for the adults and a great kids club and range of activities for the children. The hotel is set in 22 acres, with a fabulous ‘poolscape’ leading to the beach. Top Tip: It’s worth paying the extra for a full ocean view on a higher floor in one of the towers – the panorama is breath-taking. 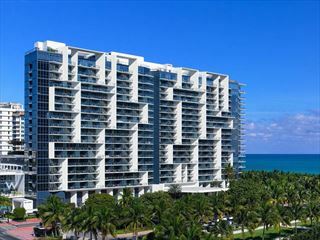 This luxurious resort is located on Collins Avenue, nestled in the heat of Millionaire's Row. This hotel is one of the most iconic in Miami Beach. Hakkasan - Enjoy flavourful Cantonese cuisine at this fourth-floor rooftop restaurant. Scarpetta - Sneak a taste of traditional Italian cuisine at this homely venue. StripSteak - A trendy, fine dining steakhouse serving up sizzling steaks that are cut directly from the hotel's on-site aging room. La Cote - Enjoy fresh French cuisine alongsde innovative cocktails and a DJ-inspired Miami Beach bar scene. Vida - Visit this sleek American brasserie for an elegant dinner. Blade - Casual vibes and classy interiors complete this laidback sushi bar. Fresh - Grab a light bite to eat at this colourful cafe, including 17 flavours of gelato and sorbet. Chez Bon Bon - A sugar lover's dream, this cafe offers one-of-a-kind sweet treats. Pizza & Burger by Michael Mina - Influenced by the chef's sons and their love of pizza and burgers, this chilled restaurant offers divine cuisine that matches that of Mina's backyard dinner parties. Bleau Bar - Offering a cool A-list vibe, this quirky bar offers classic cocktails and an expansive dance floor. Glow Bar - A truly laidback bar right by the Bowtie pool. A series of pools in landscaped gardens, featuring “walls of water” and a free-form pool. There is also an exclusive pool surrounded by cabanas and sun loungers. Families can enjoy the small dipping pools and interactive children’s waterscape play area. 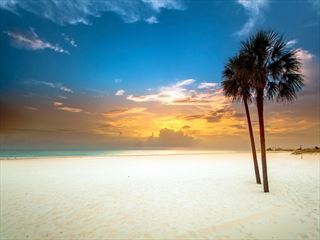 Short walk to beach, where guests can rent umbrellas, chairs, cabanas. Prices correct as at 6pm on 18 Apr 2019. Please call for final price. Prices are per person based on 2 adults sharing a room. Other durations available - call for quote. Prices include flight and accommodation as stated below and car hire including Dollar rent-a-car's 'fully inclusive' insurance for the full duration. For more car hire and transfer options please ask your travel expert. Peak Season surchage applies on the following dates: 29-31Aug14, 01-08Dec14, 30Dec14-4Jan15, 13-17Feb15, 20-23Feb15, 14-23Mar15, 23-26May15, 4-7Sep15, 1-8Dec15 and 30Dec15-04Jan16 Please ask your travel advisor for more details.